This resource accompanies the Let’s Go to the Farm song from Sing and Play Green Album. 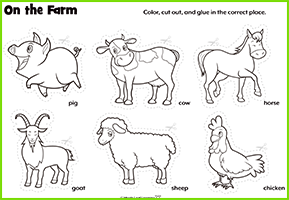 Directions: Color and cut out the farm animals, and paste them onto the correct outlines in the book pages. Fold the rest of the pages once lengthwise and once widthwise to create the mini-book pages, and use a stapler to fasten them together in the correct order. Now you have a simple picture book you can take anywhere!